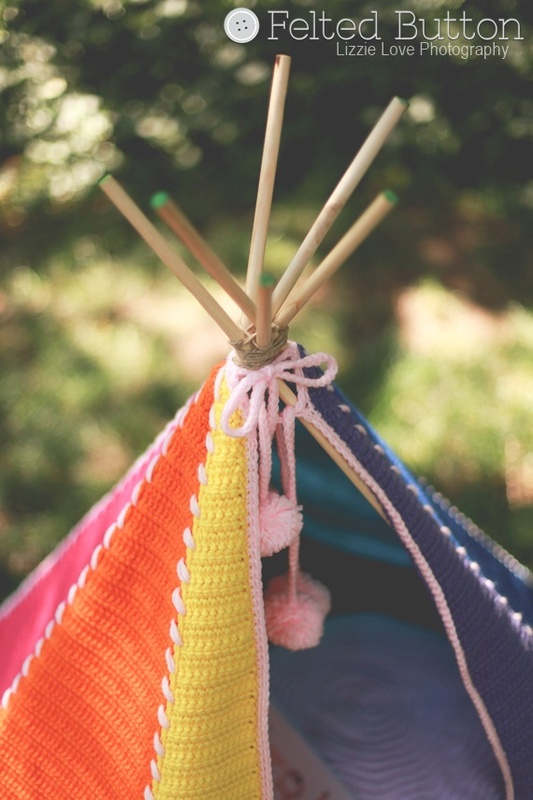 Felted Button - Colorful Crochet Patterns: It's a Teepee! 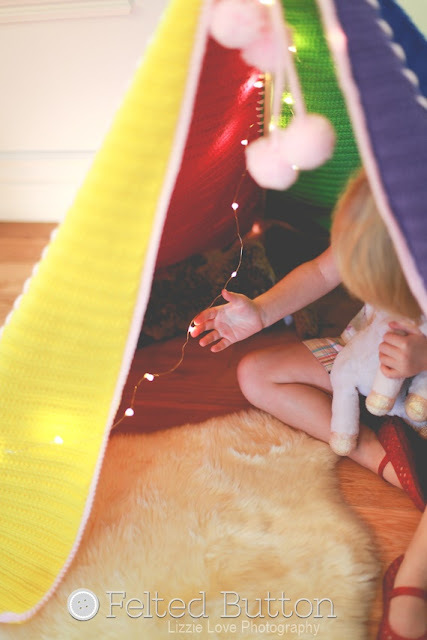 the Toddler Teepee is super fun! I made the sample in a rainbow of colors but you could make it in your little one's favorite colors or to match their bedroom or playspace. I also decided to make it with Red Heart Super Saver yarn as it is affordable, durable for play and has a superb color selection. 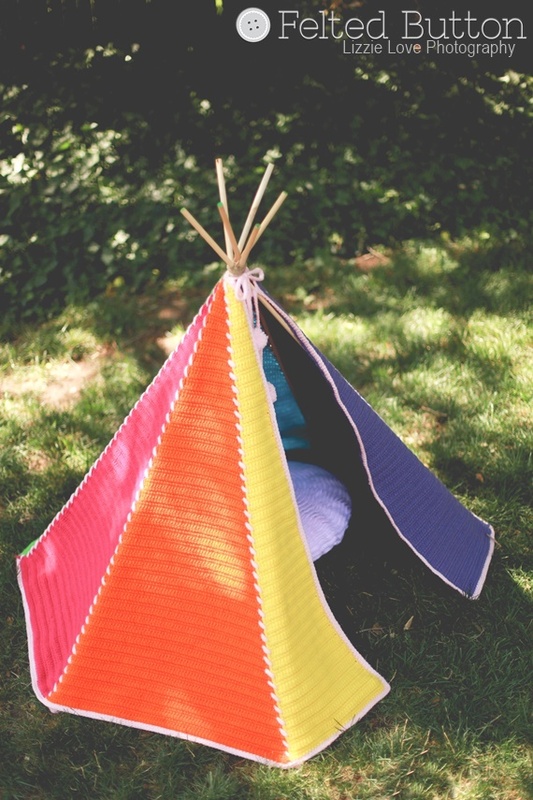 The other great thing about this teepee tent is that it is super easy to make. 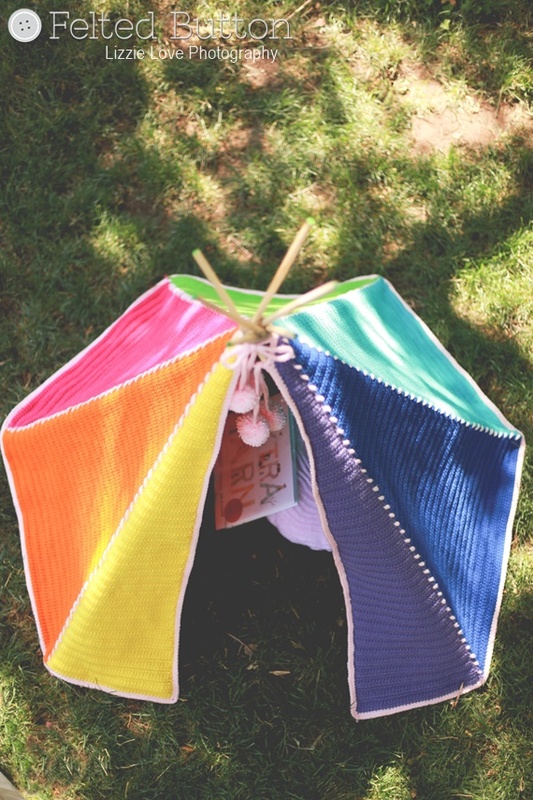 I intentionally made the joining of the triangles super simple using a whipstitch of contrasting yarn. I purchased the six dowels at my local Home Depot ($1.67 each), lashed the tops with twine and draped the cover over the frame--fastening it at the top with pom-adorned ties worked as part of the border. 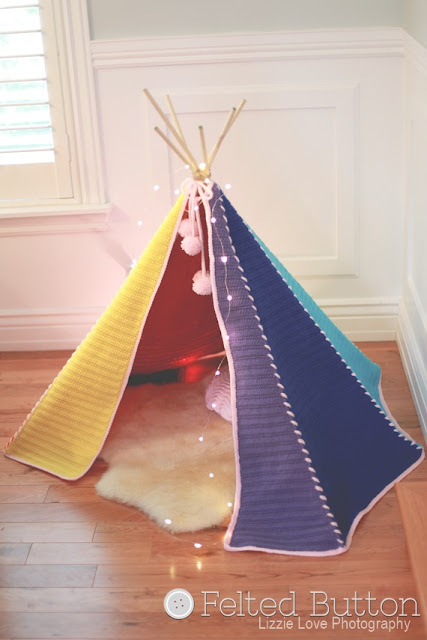 I also think that the teepee is perfect for both indoors or outside. And it's fairly simple to move from place to place, too. The Toddler Teepee is just that--designed for little ones (Ages 2-4). 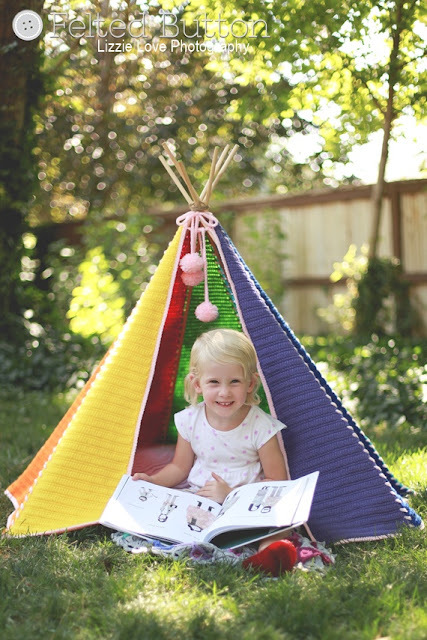 It's the perfect size for them to sit closely with a friend or spend some fun imaginary time on their own. I suppose you might be interested in making it larger, but do so at your own peril! Lol! Adjusting the pattern wouldn't be that difficult--but it will get VERY heavy and you'll definitely need much sturdier, longer and thicker poles for support. 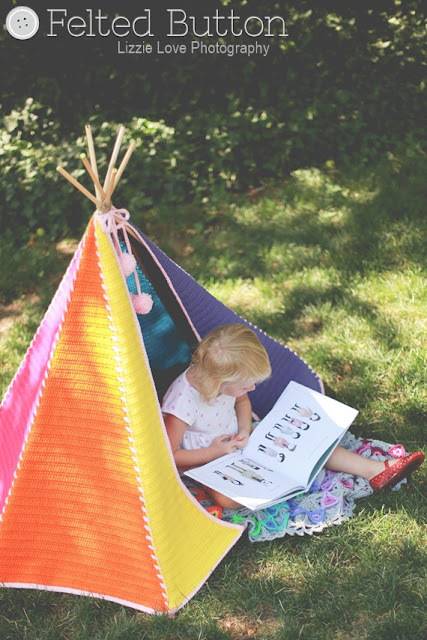 Those instructions are not included in the pattern, however. 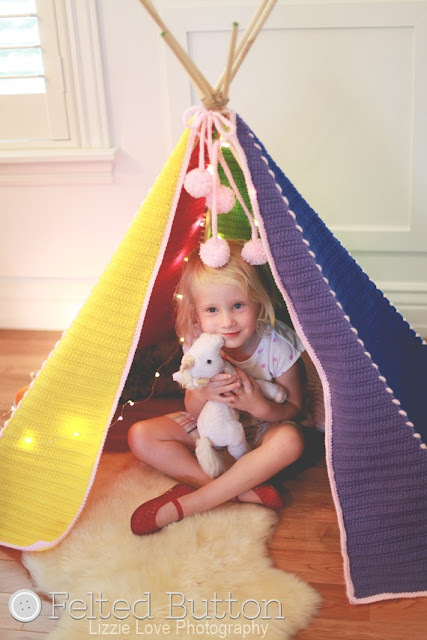 And what if you want to make it smaller--say for dollies, softies or even your cat. Totally do-able! I've got a big announcement coming up so stay in the "Button" loop with me on Facebook or Instagram (@feltedbutton) to keep abreast of my crazy and colorful happenings. | On the Board | -- No matter our circumstances, no matter our challenges or trials, there is something in each day to embrace and cherish. There is something in each day that can bring gratitude and joy if only we will see and appreciate it. May you have the very best day ever!! Thanks, Mary. You are so sweet. This is so awesome! My kids would love it!